Try not to blow off any appendages tonight! 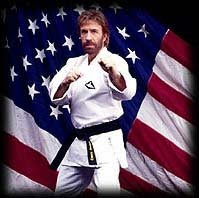 PS - Just because people will ask for one: Chuck Norris doesn't set off fireworks on July 4th. He claps his hands together for freedom and people watch the massive showers of sparks that result. So many celebrities have passed on this past two weeks, I'm beginning to feel like an obituarist on Black Tuesday at the beginning of the Great Depression: trying to write about the people jumping out of buildings whilst looking up to make sure none of them fall on me. Still, it's quite amazing to see so many famous people pass on in such a short time. Already, the people who do the Academy Awards "In Memorium" film have over half the production finished. This was going to be a much longer piece. However, there's not enough space to cover each one of these individually (I wrote the piece on Ed before the Grim Reaper floodgates opened) so we'll just leave it at "God rest your souls." Besides, however odd and peculiar (and in Michael's case just plain gross) some of the alleged details of people's lives are, at the end, they're still just people. They have people who love them and are mourning for them, so there's no point in belabouring their anxiety and pain with a few cheap jokes at their loved one's expense. Those we'll save for the maniacs who show up at the various memorial services. * With your choice of Al Sharpton or Joe Jackson as ringmaster. ** Or as we like to affectionately call them: "sleazy, hypocritical, parasitic gossip-mongers"
*** They only heard Billy. With so many celebrities passing on this past week, I've been trying to get a piece done about that. It's quite hard to do funny, yet tasteful obituaries. Gale Storm went recently, and Mollie Sugden and Karl Malden passed today. If I were a celebrity, I'd stay in with the shutters down, but obviously that didn't help Michael Jackson. In the meantime, here are a few quick observations to occupy anyone who's especially bored. As I was purchasing my comics, I mentioned to the clerk that I too thought X-Men III was a pile of steaming medical waste. He smiled insincerely and gave me a look that said, "I'm not really interested. You're not one of us. Weirdo." I felt offended for about 10 seconds when I suddenly realised that this observation was in fact a good thing. My geek days are finally over... no matter what Stew says. However, I probably shouldn't have loudly announced that I was off to meet my woman as I walked out the door. Bit cruel that. I next stopped by the local convenience store. I was trying to kill time before the pick-up game started and wandered around, leafing through the newspapers and looking over various crisps and reminding myself why I shouldn't devour a bag or two. At one point I turned the corner and noticed the clerk and a friend were watching and laughing at some sort of comedy programme on a laptop behind the counter. I was trying to figure out what it was and what was so funny, when the clerk suddenly looked at me and said, "Can I help you find anything... you're staring." He said the last bit with the same kind of look Chicago Bears linebacker Mike Singletary used to give opposing quarterbacks. It didn't work as well on a man about six inches shorter who was standing behind the counter of a 7/11. I explained that I was trying to figure out what the programme was but this only resulted in a an even more intense, weird, hostile glare from the clerk. I decided it was time to get a bottled water and check out. As "little 7/11 Mike" rang me up, he stared at me as though I was someone who'd just verbally associated his mother with barn animals (to which it goes without saying, I had not). I explained again that I was interested in what programme was on the computerand this just increased the glare by a magnification of 5. (I'm very precise about these things.) You'd think I'd spied them hiding a breadbasket full of doobies rather than watching some HBOish special. I left, shaking my head and muttering something about "nutter clerks." The only answer I have for this strange behaviour is that either A) He didn't like people staring in his direction for any reason whatsoever, B) They weren't supposed to be watching the show and he thought I was a "secret shopper" or something, or C) He thought I was gay and staring at him and his friend. The problem with all of these is A is just weird behaviour, B is hardly conducive to keeping a long term job, and C is more than a bit ego-centric. Not only am I straight as the Western US-Canadian border, but it's hardly normal for anyone to just stare at someone like they were trying to figure out a puzzle, especially if they fancied them for any reason. That wouldn't have worked on my wife. The dear woman would have shaken me and asked if I were having a petit mal seizure. Also, it's not exactly as though the computer were in line with someone's bum or anything. I would have immediately noticed that and rapidly changed my viewing angle. So, nutter clerk it is. Funny though, I was actually in the store on Saturday and he behaved quite normally. So, maybe it was just a mood swing. I refuse to exchange numbers for words though unless extremely press for space. We can't all be Prince you know. I was at a wedding on Saturday. As it was a formal occasion, I wore a suit. It turns out it was an outdoor wedding. The temperature was about 100 degrees Farenheit with a heat index of about 106. I should have looked at the wedding website, as it apparently said in bold letters: WARNING - Outdoor, superheated wedding. (I'm paraphrasing.) Stew turned up in a golf shirt. Nuffy wore something that may have been Hawaiian (but subtly so - not a grass skirt.) I felt like I was wearing my own personal sweatlodge. Actually, it was a lovely wedding, very nice couple, sweet ceremony officiated by the father (an old friend of the DOUI staff by the way). Also, the minister, and the groomsmen were dressed in black tuxedo coats and vests with dark red ties. At least I could take my coat off. Of course, by the time I did there was a sweat stain the size of Lake Victoria on my back. The wedding reception was fab. Four kinds of cheese, including blue and brie. If there had been a wedge of Wensleydale it would have been perfect. I had to settle for dumping cheese dip on the cheese. Last thought - Just exactly how do they calculate the "heat index" anyway? Most people assume it's a very complicated formula that takes into account the temperature, the humidity, the visible sunlight, butterflies beating their wings, and the proximity of any barbeques, cookouts, and other large open flames. I'm quite convinced though that the following method is used: the weatherperson steps outside the back door, sweats a moment, and then walks back in and says, "Feels like a hundred and six!"